Synchronize your TaskMerlin events and tasks on your smart phone or tablet via Google Calendar and Google Tasks. Use any web browser or native apps that sync with Google. For example, sync with the default calendar app on your iPhone, iPad or Android device and sync your tasks with apps such as GoTasks on the iPhone/iPad or Team Tasks on Android. Other phones and tablets supported include Windows Phone, Windows Surface and BlackBerry. To configure TaskMerlin for bidirectional syncing, click on the Google Sync button on the TaskMerlin toolbar and follow the setup instructions. For optimal convenience and control over the items that are synced, you can easily configure a sync folder or apply a task filter. "The best PC task management tool just got better! 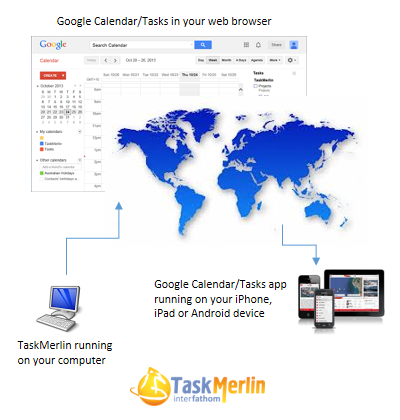 Task Merlin now syncs perfectly with Google Tasks and iPhone task management tools that work with Google. I can now manage / organize / prioritize complex task lists and bi-directionally sync them with a mobile phone on a near-real time basis for execution and tracking. Task Merlin is the most complete and comprehensive solution in the PC / mobile market."